Tips: Getting fresh water, and dealing with waste – Do your dream! For a lot of newcomers and experienced campers alike, one of the regular questions that come up is “how do I get water and empty waste” – especially on long trips. Well the easy answer is to use campsites, but of course if you like exploring more and using the Aires and Stellplatz networks across Europe, then you may benefit from some further advice. Firstly, you need to know where the aires are in order to know where facilities are to fill up with water and empty waste. You would benefit from the many Aires databases available online (some on my site), but also consider buying aires books – such as Bordatlas (Europe Wide), Camperstop (Europe Wide) and All The Aires guides (Country specific) as these tell you both where the aires are, and also what facilities they have. Importantly, NOT ALL aires have facilities!! So make sure you know. Someone reminded me that, as a last resort, you may be able to get fresh water from the water tap at churches/graveyards. If you do make sure it is drinking water (relevent in far out places). We’ve never had to resort to this yet! Many aires have just taps, many have “machines” you need to connect to. Due to the variety I can’t detail them here, and must assume when you get there you can see what you need to do! 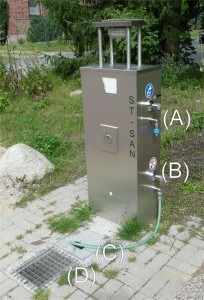 The one here pictured has a fresh water tap/nozzle (A) (with a hose-loc adapter attached already, I’d always remove that, clean, then install my own); a toilet tank cleaner tap at the bottom (B), and waste outlets on the ground (C) is for toilet and is a lift up flap; (D) is for grey waste. This one costs 1 Euro for 10 mins worth of fresh water (100 L) though the toilet tank cleaner is “always on”. Obvious to say, but don’t be tight and NEVER EVER use the toilet tank cleaner tap to fill fresh! Here is a list of our tips and advice for getting fresh water. Please also note we happily drink straight from our tank with no ill effects so they must work for us! 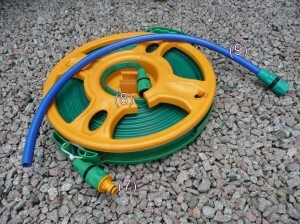 We recommend and use a plastic flat hose which can be used without being fully unwound (8). This is perfect and saves time (and space). It is infact 3 small tubes combined into a flat hose. It has standard hose-loc connectors at either end. We’ve modified this with a couple of holes and cable tie to stop the end coming out when you rewind! These are hard to find, but look XXXXXXXX. 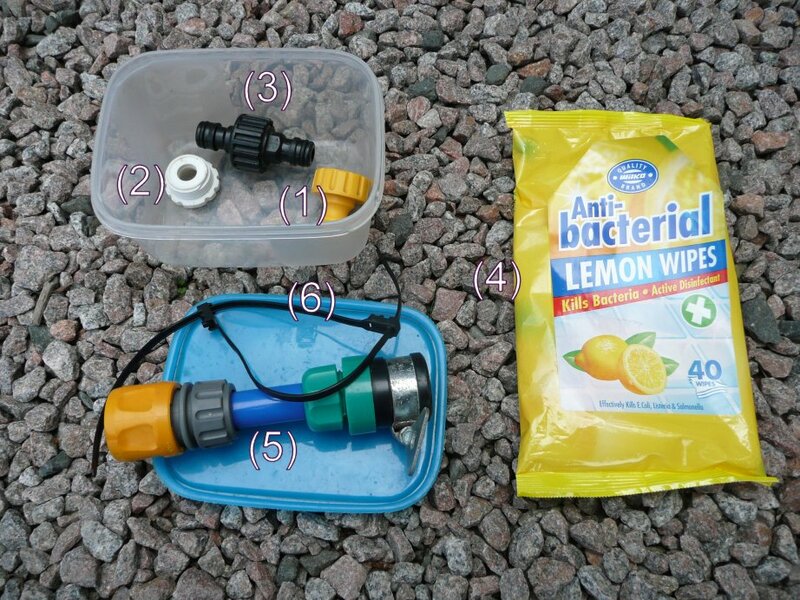 We suggest you avoid garden hoses as you can get plastic/rubber tasting water – the hose we use isn’t flagged as food quality but we have no plastic taste. Also – do not use the “flat hoses” that need to be fully unwound. These are awful, puncture on thorns, and are a pain as you have to unwind them fully each time which makes them both a hassle and dirty. 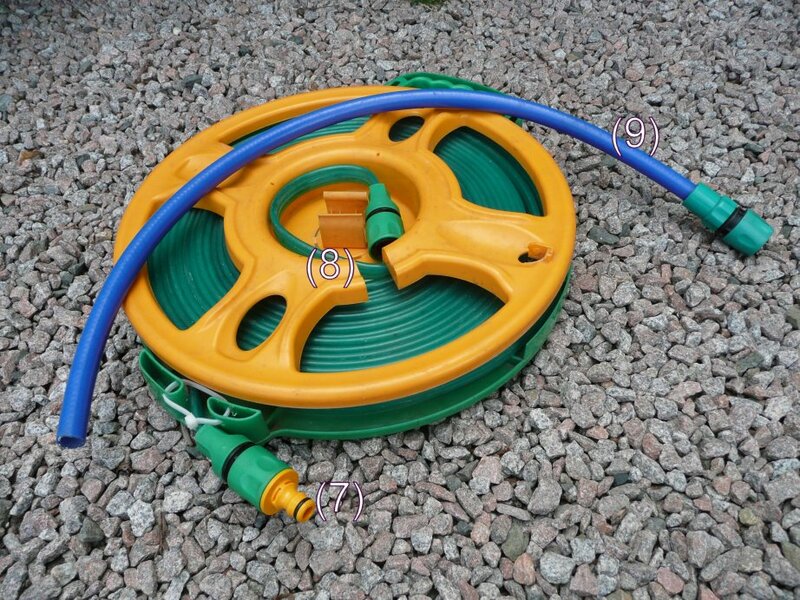 If you have the same hose as us, when you put this hose away, always let it empty by winding it all back in but leave about 1.5m lose, then raise the hose reel high. Laws of siphoning will make the hose empty itself! Also, before you put away, connect both ends with a female/female adapter to prevent any drips. The hose we use is easily packable and lightweight. The only downside is that water flow isn’t as good as a normal hose such that filling a tank may take slightly longer. On any tap, you have no idea what else it has been used for. Not everyone has the same hygiene as you. So ALWAYS thoroughly wipe down the tap with a single-use disinfectant wipe. Including inside the tap as far as you can go. If it looks dirty, go elsewhere, but generally a good disinfectant wipe is okay. We carry a few connectors most available from garden centres in a multi-pack. The main screw on connector (1 )is used in 90% of places; the smaller screw adapter (2) rarely. The push-on adapter we have (5) is used sometimes but always makes a mess! As you can see I’ve made a bit of hose with a hose-loc adapter so I can connect my hose to it (via a female/female adapter (3)). As push on adapters normally fall off, I also carry some releasable cable ties (6) to hold it onto the tap if needed. Also, some taps are “push to fill” which are a pain, so the cable ties can also be used to hold the button on. As you can see from the picture, I have a hose tail (food quality) that connects to the hose reel. This is the bit I push into the tank and thus never touches the floor and remains clean and is easily washed separately if needed. If you have a toilet flush tank, then you can use the same setup, but just hold the “tank insert” tail above the filler – never let it touch as no doubt the toilet flush chemical doesn’t taste nice! Not the nicest of jobs, but not as bad as it could be! We use the thetford blue chemical in the tank, and thetford pink in the flush. Other people have tips on using biological clothes washing liquid and other such things which we have tried. And okay they are cheaper, but the emptying is less pleasant. As a 2L (£10) bottle of Thetford blue lasts 15 or so uses then I’m happy with that! I guess the success of the other alternatives depends on how often you empty the cassette. Our cassette is big so lasts 4+ days, if you have a smaller type then the cheaper alternatives may work. Silly and obvious point, don’t put anything bar natural toilet waste and paper into the loo! In our experience, the cheap supermarket loo papers break down fine in short spaces of time. Avoid premium Andrex type brands, and don’t bother paying for the thetford specialist paper. Morrisons £1.32 for 12 rolls seem to be the best for us. Obviously discard after use and wash your hands. If your empty point has a lift up lid, always use gloves to lift the handle, and when you close it never let it drop – lower it gently to avoid splashes. Poor in the toilet cassette slowly, and if you have one remember to press the “air valve button” on the cassette! Look for a “flush/rinse” button that will give the empty point a clean. If your facility has one, I would suggest you close any lid prior to flushing – as some have powerful jets that will spray everywhere if the lid is open. As usual, keep your gloves on as you have no idea who/what pressed the button last. Unless you are packing the cassette up for the winter, you don’t want it spotless, so don’t rinse it 10 times. You need/want some bacteria left in order to facilitate the break-down process. So a couple of rinses to make sure nothing is stuck should suffice. 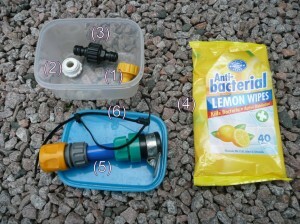 When rinsing, never use the fresh water tap (some people may, hence disinfectant wipes!) – there is normally another tap. If you must use the same tap, don’t let the cassette touch it, and also wipe down after. For rinsing, we may put in 5L of water, then shake vigorously, then pour out. Unless you are well practiced don’t forget to put the “cap” back on the toilet cassette. Once emptied, add your necessary chemical and add a splash of fresh water so the tank always has fluid covering the bottom so that hard solids can’t form. We always wipe the outside of the cassette down with a disinfectant wipe, then kitchen roll, so it goes back clean and dry. If you can’t find an aire and need to empty it, you can use public toilets. But for the sake of everyone, leave it cleaner than you found it and disinfect with wipes afterwards. IN MY OPINION there is no problem emptying down public loos or any main sewer, so long as it isn’t going into a cesspit where the chemicals may affect the operation. Almost all aires, campsites and disposal points actually connect the toilet and other waste water so in effect it goes down the same hole. In some countries, such as Finland, they may use earth-toilets which would be damaged if you disposed of toilet chemicals within them, so always check before disposing especially in far flung countries. In our experience, there are enough formal places to dispose of toilet waste correctly. We’ve never had to use the emergency public loos! But please, think and leave areas tidy – don’t make yourself and others unwelcome. Gray waste is the waste water from washing, showering, washing up etc. In other words, dirty water but generally well diluted and not unhygienic. Waste water should not smell – if it smells then you have a bacterial infection in the tank and this needs to be killed off – else the smell will become a stench! Please see the Zappys blog on this. Also, we use Thetford waste tank freshener once in a while that stops this happening. Generally the smells may become more common in hotter climates, but suggest you are prepared with an antidote just in case you start to get a pong coming through. Wherever possible, don’t put food down the sink, so when you wash up, don’t for instance shove all the food leftovers down the plughole as you would at home! We would suggest you wipe the plate with a kitchen-roll sheet to remove leftover food, such as rice, and just put it in the bin. Reducing food in the waste tank will reduce the chance of a smelly outbreak and also leaves the water cleaner. Most aires have disposal points, some are drive over and some you have to put the waste down a particular hole. If you can – great! These all vary but generally work. Many of us at home, if say, washing up outside, or indeed having an outside shower, would think nothing of letting the water drain on the grass. As such, we personally don’t have too much of a problem emptying the grey tank on or over grass or even small amounts down normal drains. Please note our waste tank is small so for us I’m talking about small quantities (20L or less). Some people may say this is wrong and inconsiderate – but personally as I’d happily through the water over my garden I think it fine (in small amounts). However we would also say that you should consider your environment and ensure you will not cause any damage. If you are a tourer-type person continually on the move, always have a plan as to where you expect to fill up and empty tanks, and always have a backup plan available. Also – never leave it to the last minute. After all our experience, we now make use of pretty much any facilities we find rather than eek out every last drop on board. We’d say the vast majority of stop-offs have the facilities as described in the books and are fine, though you will certainly find an odd few which are either broken; been removed; or have been left in such a mess you won’t want to use them… Also – do keep a selection of coins handy as you never know what you may need to operate the machine.